1. A The reaction is endothermic, meaning energy is a reactant (appears on the left side of the equation). Adding stress to the left side increases the rate of the forward reaction, creating more products. 2. D Weak bases do not ionize fully in solution, and most of the methylamine molecules will not deprotonate. The hydroxide and conjugate acid ions are created in a 1:1 ratio and therefore will be equal. 3. D Moving across a period, atomic size decreases. Therefore, atom Z will be farthest to the right (have the most protons), and thus will have the highest electronegativity value. 4. C There are 1 mole of N2, 1 mole of Ar, and 2 moles of water in the container. The mole fraction of nitrogen is: 1/4 = 0.25. 5. D When a covalent substance undergoes a phase change, the bonds between the various molecules inside the substance break apart. 6. C The oxidation state of copper changes from +1 to 0, meaning it has gained electrons and is being reduced, and reduction occurs at the cathode. Zinc’s oxidation state changes from 0 to +2, meaning it has lost electrons and is being oxidized, which occurs at the anode. 7. B 127 g is equal to 2 moles of copper, which is what appears on the balanced equation. To change one mole of copper from +1 to 0, 1 mole of electrons is required. Twice as many moles being created means twice as many electrons are needed. 9. C As the reaction progresses, [Cu+] will decrease and [Zn2+] will increase. With a lower concentration on the reactants side and a higher concentration on the products side, the reaction will shift left, decreasing the overall potential of the reaction. 10. A The electron transfer does not happen across the salt bridge, eliminating options (C) and (D). As the reaction progresses and [Cu+] decreases in the copper half-cell, positively charged sodium ions are transferred in to keep the charge balanced within the half-cell. 11. D When Q > Kc, the numerator of the equilibrium expression (the product concentration) is too big, and the equation shifts to the left. This is true for both (A) and (B), meaning [NO] would decrease. When Q < Kc, the numerator/product concentrations need to increase. This is the case in (C) and (D), but NO(g) is only a product in (D). The only tricky bit here it to remember that boron is considered stable with only six electrons in its valence shell. 13. D At a higher temperature, the average velocity of the gas molecules would be greater. Additionally, they would have a greater spread of potential velocities, which would lead to a wider curve. 14. D Nitrogen only has two shells of electrons while phosphorus has three, making nitrogen smaller and more able to attract additional electrons, meaning a higher electronegativity. Nitrogen and oxygen both have two shells, but oxygen has more protons and an effective nuclear charge of +6 vs. nitrogen’s effective nuclear charge of +5. Thus, oxygen has a higher electronegativity. 15. B First, the mass of the oxygen must be calculated: 29.05 g − 18.02 g − 3.03 g = 8.00 g.
Converting each of those to moles yields 0.5 moles of oxygen, 1.5 moles of carbon, and 3.0 moles of hydrogen. Thus, for every one oxygen atom there are three carbon atoms and six hydrogen atoms. 16. C During sections I and II, the following reaction occurs: H2CO3(aq) + OH−(aq) ↔ HCO3− (aq) + H2O(l). The endpoint of that is reached when all H2CO3 has reacted, meaning that in sections III and IV the following occurs: HCO3− (aq) + OH−(aq) ↔ CO32−(aq) + H2O(l). 17. B pH = pKa + [HCO3−]/[H2CO3]. 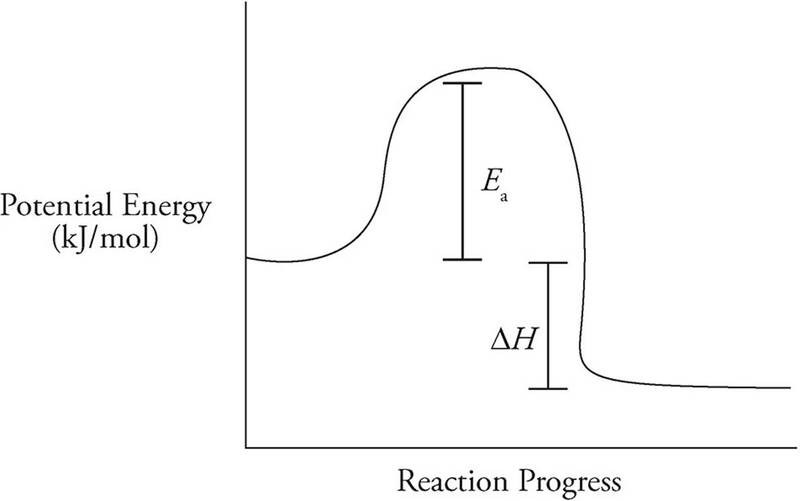 At a point in the graph where half of all the acid has reacted, the last part of the Henderson-Hasselbalch equation cancels out, leaving pH = pKa. The first equivalence point occurs at a volume of 10 mL, and thus the half-equivalence point is at a volume of 5 mL. The pH at this point is 4, so: 4 = −logKa. Ka is somewhere around 10−4. 18. C A more concentrated NaOH solution means more moles of NaOH are added per drop, so a lower volume of NaOH would be needed to add enough moles to reach the equivalence point. 19. B If extra Ca2+ ions are in solution, that means there were not enough CO32− ions present for the Ca2+ ions to fully react. 20. D Via Keq = , if ∆G is negative the value for K will be greater than one. Via ∆G = ∆H − T∆S, ∆G is always negative when ∆H is negative and ∆S is positive. 21. D The weaker the O-H bond is in an oxoacid, the stronger the acid will be because the H+ ions are more likely to dissociate. The O-F bond in HOF is stronger than the O-Cl bond in HOCl because fluorine is smaller (and thus more electronegative) than chlorine. If the O-F bond is stronger, the O-H bond is correspondingly weaker, making HOF the stronger acid. 22. B The oxidation state of nitrogen in NO is +2. If the nitrogen is reduced, that value must get more negative. The oxidation state of nitrogen in N2 is 0, so that fits the bill. The oxidation state on the nitrogen in the other choices is greater than +2. 23. A A buffer is made up of either a weak acid and its salt or a weak base and its salt. Option (B) has a strong acid and strong base, option (C) has a strong acid and its salt, and option (D) has a weak acid and a weak base. 24. A HCN will lose its proton to the hydroxide, creating a conjugate base and water. 25. C The mass of the mixture is 200.0 g; this is from the volume being 200.0 mL and the density of the mixture being 1.0 g/mL. ∆T is 7.0 °C and c is 4.2 J/g°C. 26. C This is an exothermic reaction; therefore heat is generated as a product. An increase in temperature thus causes a shift to the left, decreasing the numerator and increasing the denominator in the equilibrium expression. This decreases the overall value of K.
27. C The NaOH is limiting (0.050 mol vs. 0.100 mol in the original reaction), and adding even more excess HCN will not change the amount of HCN that acutally reacts with OH−. So, the value for ∆Hrxn stays the same. However, the overall mixture will have a greater mass (300.0 g), which means the temperature change will not be as large. 28. A In a polar solvent, polar molecules will be the most soluble (like dissolves like). Of the four options, methanol and acetone would both have dipoles, but those of methanol would be significantly stronger due to the H-bonding. 29. D Potassium’s first valence electron is in the fourth energy level, but both chlorine and argon’s first valence electron is in the third energy level. 30. B Cr3+ needs to gain three electrons to reduce into Cr(s), while Mg(s) loses 2 electrons to oxidize into Mg2+. To balance the electrons, the reduction half-reaction must be multiplied by two and the oxidation half-reaction must be multiplied by three in order to have six electrons on each side. The nitrate ion is a spectator and would not appear in the net ionic equation. 31. B Increasing the pressure in an equilibrium reaction with any gas molecules causes a shift to the side with less gas molecules—in this case, the product. 32. A During a phase change, all of the energy added goes towards breaking the intermolecular forces holding the molecules together. During this time, the speed of the molecules (and thus the temperature) does not rise. 33. A In an endothermic reaction, heat is transferred into the reaction system. 34. D None of the options would decrease the rate of reaction, which would be required for the half-life of the reactant to increase. 35. C To determine the number of moles of SO3 created, stoichiometry must be used. The oxygen is in excess, and only 2.0 mol of it will react. (As every 2 moles SO2 react with 1 mol of O2). Thus, 4 mol of SO3 are created and 4.0 mol of O2 remain. 36. B If 4 mol of SO3 are created and 4.0 mol of O2 remain, there are 8.0 mol of gas present after the reaction. Prior to the reaction there were 10.0 mol of gas. If there are 8/10 = 80% as many moles after the reaction, there is also 80% as much pressure. 37. A If all gases are at the same temperature, they have the same amount of kinetic energy. Given that KE = 1/2 mv2, if all three gases have the same KE, the gas with the least mass must have the highest velocity in order to compensate. 38. C One of the assumptions of kinetic molecular theory is that the amount of intermolecular forces between the gas molecules is negligible. If the molecules are moving very slowly, the IMFs between them are more likely to cause deviations from ideal behavior. 39. C The strength of an acid is dependent on the amount it dissociates in solution. A low dissociation is signified by a low presence of hydrogen ions. The weakest acid is choice (C). 41. C Nitrate has a bond order of = 1.33. Nitite has a bond order of = 1.5. A higher bond order means shorter and stronger bonds. 42. 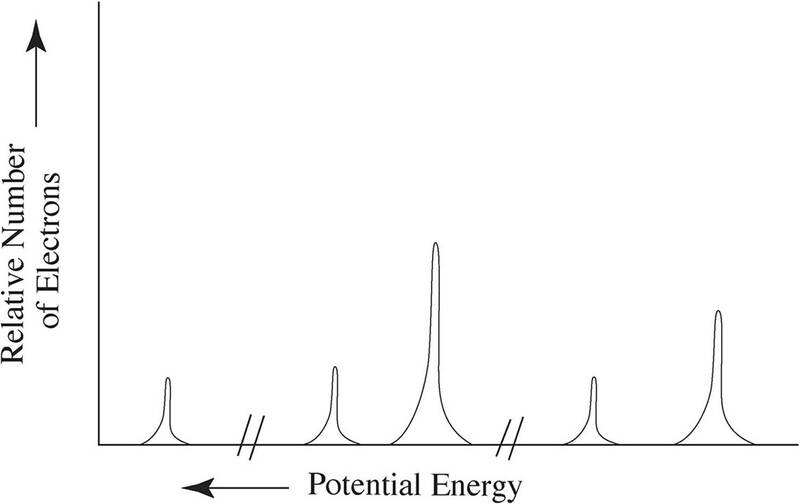 D Mass spectrometry is used to determine the masses for individual atoms of an element. Through mass spectrometry, it is proven that each element has more than one possible mass. 43. D Entropy is a measure of a system’s disorder. In a larger flask, the gas molecules will spread farther apart and become more disordered. 44. C The only species that is present at t = 0 is the NO2, allowing us to identify line III. When identifying line I vs. line II, the NO will be generated twice as quickly as the O2 due to the coefficients, meaning [NO] will increase about twice as quickly as [O2]. 45. C At equilibrium, the concentrations of all species in the reaction are remaining constant, which shows up as a flat line on the graph. The rate of both the forward and reverse reactions are constant at equilibrium. 46. A The only factor that can affect the value of the equilibrium constant is temperature. If the temperature does not change, neither does the equilibrium constant. 47. A If additional O2 were injected into the container, the reaction would shift left, increasing the amount of NO2 present. Eventually, the reaction would reach equilibrium again, meaning the lines would level out. 48. B To determine the change in concentration at a specific time, we would need the slope of the line at that point. As the line is curved, the only way to do that (without calculus) is to draw a line tangent to the curve at that point and measure its slope. 50. C Use M1V1 = M2V2 to determine the necessary volume of stock solution. When creating solutions with acid, you always add some water first, as the process is extremely exothermic and the water will absorb the generated heat. 51. A The temperature increase is indicative of energy being released, meaning the reaction is exothermic. The entropy (disorder) of the system is increasing as it moves from three gas molecules to five. 52. 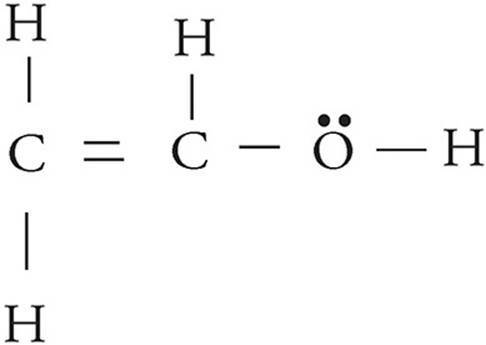 D The overall reaction (excluding spectator ions) is: 2 OH− + Cu2+ → Cu(OH)2(s). Both the K+ and the NO3− are spectator ions which are present in solution both before and after the reaction. Additionally, if equimolar amounts of the two reactants are initially present, the OH− will run out before the Cu2+, meaning that some Cu2+ ions will also be present in the final solution. 53. B Vapor pressure is dependent on intermolecular forces. The weaker the IMFs are, the easier it is for molecules to escape from the surface of the liquid. To begin, polar molecules have stronger IMFs than nonpolar molecules. Methanol and ethanal are both polar, but methanol has hydrogen bonding meaning it has stronger IMFs (and thus a lower vapor pressure) than ethanal. Ethene and propane are both nonpolar, but propane is larger meaning it is more polarizable than ethene and thus has stronger IMFs and lower vapor pressure. 54. D Water is polar, and using “like dissolves like,” we know that only polar solvents will be able to fully mix with it to create a homogenous solution. 55. B Both are nonpolar, but propane has a lot more electrons and thus is more polarizable than ethene. 56. C Catalysts work by creating a new reaction pathway with a lower activation energy than the original pathway. 57. C The molecule would be the most stable when it has the largest attractive potential energy, which is represented by a negative sign. While the magnitude of the potential energy may be larger at (A), it is repulsive at that point because the nuclei are too close together. 58. D Adding (or removing) any species in an equilibrium reaction does not change the equilibrium constant and also does not change the magnitude of the Gibbs free energy at standard conditions. 60. C Alloys of any type generally have malleability that is very similar to the metals from which they are created. 1. A student is tasked with determining the identity of an unknown carbonate compound with a mass of 1.89 g. The compound is first placed in water, where it dissolves completely. The Ksp values for several carbonate-containing compounds are given below. The student should use the strontium nitrate. Using it would create strontium carbonate, which has the lowest Ksp value. That means it is the least soluble carbonate compound of the three and will precipitate the most possible carbonate ions out of solution. The ntirate solution should be in excess. In order to create the maximum amount of precipitate, enough strontium ions need to be added to react with all of the carbonate ions originally in solution. Having excess strontium ions in solution after the precipitate forms will not affect the calculated mass of the carbonate in the original sample. (d) After titrating sufficient solution to precipitate out all of the carbonate ions, the student filters the solution before placing it in a crucible and heating it to drive off the water. After several heatings, he final mass of the precipitate remains constant and is determined to be 2.02 g.
The mass percent of carbonate in each compound must be compared to the experimentally determined mass percent of carbonate in the sample. The compound is most likely potassium carbonate. The only ions present in the flask are Fe2+, SO42−, and H+. The latter two are colorless, so the solution would be pale green. The MnO4− is reduced to Mn2+ upon entering the flask, and the Fe2+ ions are oxidized into Fe3+ ions. The solution would become less green as more yellow as more Fe3+ ions are formed, as all other ions present are colorless. After the Fe2+ ions have all been oxidized, there is nothing left to donate electrons to the MnO4− ions. Therefore, they will no longer be reduced upon entering the flask, and the solution will take on a light purplish/yellow hue due to the mixture of MnO4− and Fe3+ ions. If the volume of FeSO4 was artificially low in the calculations, that would lead to the experimental value for the concentration of FeSO4 being artificially high. As the calculated value for the concentration of FeSO4 was too low, this error source is not supported by data. If the molarity of the permanganate was artificially low in the calculations, the moles of permanganate, and by extension, the moles of Fe2+ would also be artificially low. This would lead to an artificially low value for the concentration of FeSO4. This matches with the experimental results and is thus supported by the data. To determine the amount of enthalpy change, Lewis structures of all of the species should be drawn. You have to account for not only how many bonds are within each molecule, but also how many of those molecules there are. For instance, there are three N-H bonds in NH3, so with two NH3 molecules there will be six total N-H bonds broken. The bond energy for the other three molecules must be calculated the same way. We will use the Gibbs free energy equation here. Keep in mind the units have to match. In this solution, the units for entropy have been converted to kJ. The value for ∆G is negative, therefore the reaction is thermodynamically favored at 25°C. The value for DH is negative; therefore it is an exothermic reaction and energy will be released. To determine how much energy is released, the limiting reagent must be determined. As the N2O would produce less energy, it would run out first and is thus limiting. The answer is thus −96.74 kJ. (e) On the reaction coordinates below, draw a line showing the progression of this reaction. Label both ∆H and Ea on the graph. 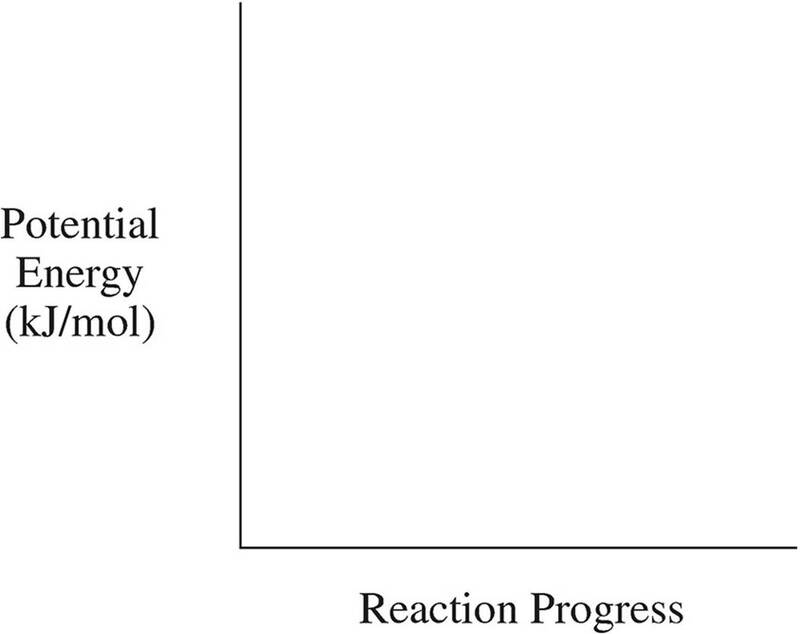 The activation energy describes the distance between the bond energy of the reactants and the energy of the activated state. In terms of enthalpy, the value for ∆H is negative, so that means that the bond energy of the products will be lower than that of the reactants. (a) Using formal charge, determine which structure is the most likely correct and circle it. As oxygen is more electronegative than carbon, an oxygen atom is more likely to have the negative formal charge than a carbon atom. The left-hand structure is most likely correct. Single bonds consist of sigma bonds, and double bonds consist of one sigma and one pi bond. There are a total of three sigma bonds and one pi bound around the carbon atom. The hydrogen ion will attach to the negatively-charged oxygen. H3PO4 is the only weak acid, meaning it will not dissociate completely in solution. Therefore, it is acid 2. H2SO4 and HCl are both strong acids that will dissociate completely, but H2SO4 is diprotic, meaning there will be more H+ ions in solution and thus a higher conductivity. Therefore, H2SO4 is acid 3, and HCl is acid 1. First, the number of moles of hydrogen ions and methylamine need to be determined. Finally, use the Henderson-Hasselbalch equation. Within each energy level (except for the first), there are subshells which are not the exact same distance from the nucleus. Both energy levels 2 and 3 have s and p subshells, and while the electrons in those shells will have similar ionization energy values, they will not be identical. Thus, the five peaks represent 1s, 2s, 2p, 3s, and 3p. The heights of the peaks represents the ratio of electrons present in each of them. All three s peaks are exactly one third the height of the 2p peak, meaning there are three times more electrons in 2p than in any of the s subshells. The 3p peak is only twice as high as the s peaks, therefore, there are twice as many electrons in 3p than in any of the s subshells. To determine the net equation, all three equations must be added together, and species that appear on both sides of the arrow can be eliminated. There are no catalysts present, but NH2Cl, N2H5+, and OH− are all intermediates in the process. The overall rate law will match the rate law of the slowest step. The rate law of an elementary step can be determined by the reactants present, and in this case, the rate law for Step 1 matches the overall rate law. Therefore, Step 1 is the slowest step.